Ishvara Puri’s disciples were Kashisvara Brahmachari and Govinda. Being ordered by Ishvara Puri at the time of his departure from this world, they both arrived in Nilachala and met Mahāprabhu. The Lord considered them both to be His superiors because they had personally served His spiritual master, but He nevertheless accepted their service because it was His guru’s order. śrī-kāśīśvara-govindau tau jātau prabhu-sevakauŚrīla Kashisvara Pandit (also Brahmachari or Gosvāmī) was Kṛṣṇa’s servant Bhringara or the sakhi Sashirekha. Kashisvara Pandit’s home was in the village of Chatra in the district of Hooghly, about one mile from the present day Serampore railway station. His father was Vasudeva Bhattacharya, a Brahmin of the Vatsya gotra in the line of Kanjilal Kanu. He also had the title Chaudhuri and hence the place where he established the temple has come to be known as Chaudhuri Para. There he installed the deities of Gauranga and Śrī Radha Govinda whose annual festival is held on Ḍola Purnima. Kashisvara Pandit was especially known for his physical strength. Sri Rudra Pandit of Vallabhpura was his nephew. Kashisvara Pandit was a disciple of Ishvara Puri who had received much mercy from him. For this reason he is counted as one of Chaitanya Mahāprabhu’s branches. Śrī Govinda was also Ishvara Puri’s disciple. Both of them devotedly served their spiritual master as long as he was present in this world. Just before he disappeared, he instructed them both to go engage in Mahāprabhu’s service. Govinda was the first to come to Puri to serve the Lord after the disappearance of their guru; Kashisvara Pandit travelled throughout India on a pilgrimage before finally coming to Mahāprabhu’s lotus feet. On another day, Kashisvara Gosai arrived; the Lord greeted him respectfully and gave him a place to stay with Him. Mahāprabhu felt something of a quandary about accepting the service of His guru’s servants. He consulted with Sarvabhauma Bhattacharya, saying, “The servant of My spiritual master is My superior, so how can I accept his service? On the other hand, if I do not obey My Guru’s order, that too would be an offence. 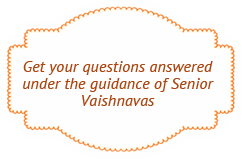 What should I do?” Sarvabhauma Bhattacharya answered that the spiritual master’s order should take priority and so the Lord followed his guru’s directives and accepted Govinda and Kashisvara Pandit as His personal servants. On the order of his father, Parashuram killed his own mother Renuka as though she were an enemy. When He heard this, Lakshman accepted the order of His elder brother Rama, for the orders of a guru are not to be debated. I must follow the order of my guru because he is a great soul. You will certainly benefit from this, but even more so will I. Whenever Mahāprabhu went to see Lord Jagannath, Kashisvara would use his physical strength to hold back the crowds, allowing the Lord to pass without being touched by anyone. Ishvara Puri’s disciples were Kashisvara Brahmachari and Govinda. Being ordered by Ishvara Puri at the time of his departure from this world, they both arrived in Nilachala and met Mahāprabhu. The Lord considered them both to be His superiors because they had personally served His spiritual master, but He nevertheless accepted their service because it was His guru’s order. Govinda would engage in personal, bodily service, while Kashisvara would go before Him when He went to see Lord Jagannath. He would push people aside to make a path for the Lord so that He could go through the crowd without being touched. Mahāprabhu joyfully took the devotees to the temple to see Lord Jagannath. Kashisvara led the way, clearing the path, while Govinda followed carrying the Lord’s waterpot. In Puri, when the Lord was dancing in front of Lord Jagannath’s cart, three rings of people would be formed around the Lord in order to hold the people back. The innermost ring consisted of Nityananda Prabhu and other devotees, the second of Kashisvara, Mukunda and others, and the third of King Prataparudra and his subjects. Kashisvara, Mukunda and many other devotees held hand to form a second protective circle. Kashisvara Pandit was one of the seven persons who would serve maha prasad to Mahāprabhu and the other devotees after the kirtan at the Rathayatra. The others who served Prasad were Svarupa Damodar, Jagadananda Pandit, Damodar Pandit, Gopinath, Baninath and Shankar. Kashisvara Pandit also participated in some of the Lord’s pastimes in Nabadvīpa, such as the kirtans at Srivas Angan and bathing in the Ganges. He was also present when the Lord went with kirtan to the house of Śridhar Pandit and drank from his iron pot. He, along with the other devotees present, cried to see the Lord’s mercy on that occasion. Govinda, Govindananda, Srigarbha, Sriman, Jagadananda Pandit and Rama were others present on that occasion. Vrindavan Das Ṭhākura tells just how dear Kashisvara Pandit was to the Lord, calling Mahāprabhu Kashisvara’s heart on one occasion (Chaitanya Bhagavata 2.1.6) and the wealth of Kashisvara’s life (Kashisvara-prāṇa-dhana) on another. Kashisvara Pandit was also present when Mahāprabhu went to greet Advaita Acharya and the other devotees on their arrival from Bengal. His disappearance day is on the fourteenth day of the waxing moon (sukla caturdasi) in the month of Karttik. According to another opinion, it is on the full moon day of the month of Ashwin, when Radha and Kṛṣṇa’s Rasa Purnima is also celebrated. Pictured Kasisvara Pandita’s Deity of Gaura-Govinda.